Historical information about Catholic priests and Muslim clerics being willing accomplices in the genocide of the Yugoslavia's Serbian, Jewish and Roma population during the Second World War. During the Second World War in Yugoslavia, Catholic priests and Muslim clerics were willing accomplices in the genocide of the nations Serbian, Jewish and Roma population. From 1941 until 1945, the Nazi-installed regime of Ante Pavelic in Croatia carried out some of the most horrific crimes of the Holocaust (known as the Porajmos by the Roma), killing over 800,000 Yugoslav citizens - 750,000 Serbs, 60,000 Jews and 26,000 Roma. In these crimes, the Croatian Ustasha and Muslim fundamentalists were openly supported by the Vatican, the Archbishop of Zagreb Cardinal Alojzije Stepinac (1898-1960), and the Palestinian Grand Mufti of Jerusalem, Hajj Amin al-Husseini. Many of the victims of the Pavelic regime in Croatia were killed in the war's third largest death camp - Jasenovac, where over 200,000 people - mainly Orthodox Serbs met their deaths. Some 240,000 were "rebaptized" into the Catholic faith by fundamentalist Clerics in "the Catholic Kingdom of Croatia" as part of the policy to "kill a third, deport a third, convert a third" of Yugoslavia's Serbs, Jews and Roma in wartime Bosnia and Croatia (The Yugoslav Auschwitz and the Vatican, Vladimar Dedijer, Anriman-Verlag, Freiburg, Germany, 1988). We will kill one part of the Serbs, the other part we will resettle, and the remaining ones we will convert to the Catholic faith, and thus make Croats of them (Dedijer, p 130). Budak was talking about something that had already started: In an example of savage butchery carried out in the village of Glina on May 14th 1941, hundreds of Serbs were brought to a church to attend an obligatory service of thanksgiving for the fascist state of Croatia. Once the Serbs were inside, the Ustashe entered the Church armed only with axes and knives. They asked all present to produce their certificates of conversion to Catholicism - but only two had the required documents, and they were released. The doors of the church were locked and the rest slaughtered. Like with the Jews, who had to wear the Star of David in public, the Serbs were forced to wear a blue band with the letter "P" (i.e., Orthodox) on their sleeve. The Nazi regime decreed that the Roma were to be "treated as Jews" and they were forced to wear yellow armbands. (A History of the Gypsies of Eastern Europe and Russia, David M. Crowe, St. Martin's Griffin, New York, USA, 1994). "God, who directs the destiny of nations and controls the hearts of Kings, has given us Ante Pavelic and moved the leader of a friendly and allied people, Adolf Hitler, to use his victorious troops to disperse our oppressors... Glory be to God, our gratitude to Adolf Hitler and loyalty to our Poglavnik, Ante Pavelic." The involvement of Catholic clergy either in active participation or in blessing the Ustashi involvement in the Holocaust is well-documented. Stepinac himself headed the committee which was responsible for forcible "conversions" to Roman Catholicism under threat of death, and was also the Supreme Military Apostolic Vicar of the Ustashi Army, which effected the slaughter of those who failed to convert. Stepinac was known as the 'Father Confessor' to the Ustashi and continually bestowed the blessing of Catholic Church upon its members and actions. 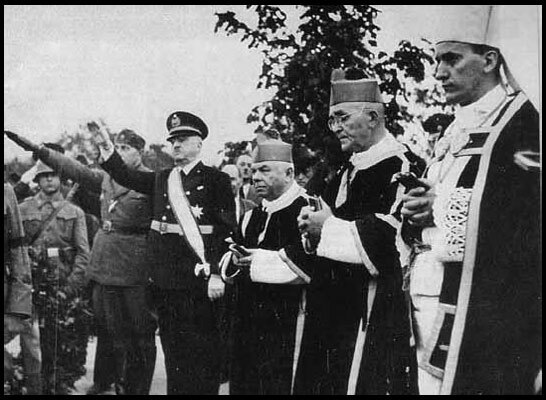 Right from the very beginning, the Vatican knew what was happening in Croatia, and certainly known to Pius XII when he greeted Pavelic in Vatican - jus four days after the massacre at Glina. On this visit, Pavelic had a "devotional" audience with Pius XII, and the Vatican granted de-facto recognition of fascist Croatia as a "bastion against communism" - despite the fact that the Vatican still had diplomatic ties with Yugoslavia. Cornwell observes that right from the start it was known that Pavelic was a "totalitarian dictator", a "puppet of Hitler and Mussolini", that he had passed racist and anti-Semitic laws, and that he was "bent on enforced conversions from Orthodox to Catholic Christianity". Effectively, on behalf of Hitler and Mussolini, the Pope was "holding Pavelic's hand and bestowing his papal blessing" to the new puppet state of Croatia. Thus, it can argued, that the Catholic Cardinals in the Vatican were accomplices of the Holocaust in Yugoslavia and the extermination of the countries Jews, Serbs and Roma citizens. Indeed, many of members of Croatian Catholic clergy took a "leading part" in the Holocaust. "Priests, invariably Franciscans, took a leading part in the massacres. Many, went around routinely armed and performed their murderous acts with zeal. A Father Bozidar Bralow, known for the machine gun that was his constant companion, was accused of performing a dance around the bodies of 180 massacred Serbs at Alipasin-Most. Individual Franciscans killed, set fire to homes, sacked villages, and laid waste the Bosnian countryside at the head of Ustashe bands. In September of 1941, an Italian reporter wrote of a Franciscan he had witnessed south of Banja Luka urging on a band of Ustashe with his crucifix." (p 254). "The most ideal thing would be for the Serbs to return to the faith of their fathers, that is, to bow the head before Christ's representative (the Pope). Then we could at last breathe in this part of Europe, for Byzantinism has played a frightful role in the history this part of the world" (p 265). The Pope was better informed of the situation inside Yugoslavia than he was about any other area of Europe. His apostolic delegate, Marcone, was a regular visitor to Croatia, travelling on military planes between Rome and Zagreb. Cornwell describes Marcone - who was the Popes personal representative in Croatia - as "an amateur who appeared to sleepwalk through the entire bloodthirsty era" (p 257). "The worst atrocities are being committed in the environs of the archbishop of Zagreb [Stepinac]. The blood of brothers is flowing in (the) streams. The Orthodox are being forcibly converted to Catholicism and we do not hear the archbishop's voice preaching revolt. Instead it is reported that he is taking part in Nazi and Fascist parades" (p 256). Throughout the whole war in more than 150 newspapers and magazines, the church justified the fascist state under Pavelic as the work of God. Many Roman Catholic priests served the Ustasha state in high positions. The pope appointed the highest military vicar for Croatia. The latter had a field chaplain in every unit of the Ustasha army. The task of this field chaplain consisted among other things of repeatedly goading the Ustasha units in their mass murders of the peasant population. High dignitaries of the Roman Catholic Church and of the Ustasha state together organized the mass conversion of the Orthodox Serbian population. Hundreds of Orthodox churches in Serbia were plundered and destroyed; the three highest dignitaries and two hundred clerics were murdered in cold blood; the remainder of the clergy were driven into exile. In the concentration camp of Jasenovac, hundreds of thousands of Serbs were murdered under the command of Roman Catholic priests. The papal emissary Marcone was in Croatia during this entire time. He sanctioned silently all the gory deeds and permitted pictures of himself with Pavelic and the German commanders to be published in the newspapers. After the visit to Pope Pius XII, Ante Pavelic exchanged Christmas and New Year's greetings with him that were published in the Ustasha press. The Catholic Church was not only closely involved with the Ustasha movement in wartime Croatia, it helped many Nazi war criminals escape at the end of the war, including Ante Pavelic, who fled to Argentina via the Vatican and the "ratlines" of the Vatican. In mid-year 1986 the U.S. government released documents of their counter-espionage agency, the OSS. These reveal that the Vatican had organized a safe-flight route from Europe to Argentina for Pavelic and two hundred of his advisors known by name. The fascists hid frequently during their flight in cloisters and in many instances disguised themselves as Franciscan monks (Pavelic himself escaped disguised as a Catholic priest). Also, at the end of the war, the Ustashe looted some $80 million from Yugoslavia, much of which was composed of gold coins. Here again, they had the total collaboration of Vatican, which according to Cornwell included not only hospitality of a pontifical Croatian religious institution (the College of San Girolamo degli Illirici in Rome), but also provision of storage facilities and safe-deposit services for the Ustashe treasury. During the war, the College of San Girolamo became a home for Croatian priests receiving Vatican-sponsored theological education - after the war, it became the headquarters for the postwar Ustashe underground, providing Croatian war criminals with escape routes to Latin America. A leading figure at the College of San Girolamo was the Croatian priest and Nazi war criminal Father Krunoslav Draganavic - described once by U.S. intelligence officials as Pavelic's "alter ego". His arrival in Rome in 1943 was to coordinate Italian-Ustashe activities, and after the war, he was a central figure in the organising escape routes for Nazi's to Argentina. It was later claimed that members of the CIA had said that he had been allowed to store the archives of the Croatian legation inside the Vatican, as well as valuables brought out of Yugoslavia by fleeing Ustashe in 1945. The most famous Nazi mass-murderer who passed through the College of San Girolamo was Klaus Barbie, known as the Butcher of Lyons, the Gestapo police chief in that French city between 1942 and 1944, who had tortured and murdered Jews and members of the French resistance. Barbie lived under Draganavic's protection at San Girolamo from early 1946 until late 1947, when the US Counter Intelligence Corp helped him escape to Latin America. Another Nazi war criminal, Franz Stangl, the commandant of the Treblinka death camp was assisted with false papers and hiding places in Rome by the Nazi sympathizer Bishop Alois Hudal. Draganavic was expelled from San Girolamo a few days after Pope Pius XII death in October 1958. While it may be true that individual Catholics risked their lives to save the Jews, Roma and Serbs from the Holocaust, the Catholic Church, as an entity, did not. The Vatican also assisted thousands of Nazi war criminals such as Adolph Eichmann, Franz Stangl (the commandant of Treblinka), Walter Rauf (the inventor of the "mobile" gas chamber), and Klaus Barbie (the "Butcher of Lyons"). Pope Pius XII personally authorized the smuggling of Nazi war criminals, which was directed by his political advisor Giovanni Montini (who later became Pope Paul VI). Shortly before his death in Madrid in 1959, Pope John XXIII granted Pavelic his special blessing. On his death bed, Pavelic held a wreath that was a personal gift from Pope Pius XII from the year 1941. After the war Stepinac was arrested by the Yugoslav government and sentenced to 17 years in prison for war crimes. A parade of prosecution witnesses at his trial in Zagreb testified on October 5, 1946, that Catholic priests armed with pistols went out to convert Orthodox Serbs and massacred them. In one instance, one witness said 650 Serbs were taken into a church under false pretenses, and then were stabbed and beaten to death by Ustashi members after the doors were locked. Stepinac was convicted on all principal counts of aiding the Axis, the Nazi puppet of Ante Pavelic, and of glorifying the Ustashi in the Catholic press, pastoral letters, and speeches. He eventually died under house arrest in 1960 after being sentenced to life imprisonment for collaboration by the postwar communist government in Yugoslavia. The Investigation by the Yugoslav War Crimes Commission established that Stepinac had played a leading part in the conspiracy that led to the conquest and breakdown of the Kingdom of Yugoslavia in 1941. It was furthermore established that he had played a role in governing the Nazi puppet state of Croatia, that many members of his clergy participated actively in atrocities and mass murders, and, finally, that they collaborated with the enemy down to the last day of the Nazi rule, and continued after the liberation to conspire against the newly created Federal Peoples Republic of Yugoslavia. Stepinac only served a few years in prison because of the Vatican's anti-Communist propaganda of the "suffering martyr" and their organizing of "Cardinal Stepinac Associations" which lobbied for his release. Jews and Serbs say that Stepinac was a Nazi collaborator. Catholic supporters claim he initially backed the regime, but later withdrew his support because of the mass executions and forced conversions of Orthodox Christians to Catholicism - although little credible evidence is presented of this. Like the French Nazi Jean-Marie Le Pen (who described the Holocaust as a "mere detail of history"), Tudjman also become a Holocaust revisionist. In his book Wastelands of History, he questioned the truth behind the Holocaust and moved to cover up the role of Ustashe regime in the darkest period of Croatia's history. Worse, Tudjman rehabilitated fascist war criminals and gave them medals, and, as in the case of Stepinac, had streets named after them. "Persons who assisted Jews but simultaneously collaborated or were linked with a Fascist regime which took part in the Nazi orchestrated persecution of Jews, may be disqualified for the Righteous title". The Franciscan order has always denied the evidence of its wartime ties to the Ustasha regime in Croatia. They acted as facilitators and middlemen in moving the contents of the Ustasha Treasury from Croatia to Austria, Italy and finally South America after the war. During the Nazi occupation of Bosnia, the Franciscans were closely involved with the Ustashe regime. Not far from Medjugorje in Bosnia (where the Virgin Mary is said to put in nightly appearances for the tens of thousands of Roman Catholic pilgrims), is the Franciscan monastery at Sirkoi Brijeg which has become the centre of allegations linking it to disappearance of the Ustashe treasury after the war. In San Francisco Federal Court in November 1999, in what was described as "tangible proof" of the Nazi Franciscan connection, was obtained when cameramen working for Phillip Kronzer (who has helped expose the Medjugorje myth) obtained entry to the Monastery and filmed a secret shrine honouring the Ustashe. A plaque dedicated to Franciscan monks who were Ustasha members was filmed along with a massive shrine lining the walls complete with photographs of Ustasha soldiers some in Nazi uniforms. The admonition, "Recognize us, We are yours" can clearly be seen in the video footage. On a later visit to the monastery the shrine had been dismantled but the videotape preserved the evidence and has now been made available by the Kronzer Foundation. A Freedom of Information Act lawsuit was filed in August 2000 in San Francisco, USA by California attorneys Jonathan Levy and Tom Easton against the U.S. Army and the CIA. Easton and Levy are also pursuing a Holocaust era lawsuit against the Vatican Bank and Franciscan Order regarding the disappearance of the World War II Nazi Croatian treasury including gold, silver, and jewels plundered from concentration camp victims in Croatia and Bosnia, mainly Serbs, Jews, and Gypsies. The lawyers are seeking the release of over 250 documents from the files of Draganavic. He is now regarded as one of the of the principal operators of the so-called Vatican "ratline" that smuggled Nazis and their loot to South America between 1945 and the late 1950's. Beneficiaries of the ratline included Adolf Eichman, Klaus Barbie "the butcher of Lyons" and the notorious Croatian mass murderer Ante Pavelic as well as thousands of lesser known Nazis and collaborators. While file releases on the ratline date from as early as the 1983 Barbie case, a core of documents remain withheld on grounds of "national security." It is these documents the attorneys want from the Army and CIA. They describe him as a "sinister priest" who is alleged to have worked at various times for the secret services of Croatia, the Vatican, the Soviet Union, and Yugoslavia as well as British and American intelligence. The attorneys have suggested that the withheld documents, most well over 40 years old are highly embarrassing to the Americans, the British, and Vatican and hold the key to a multinational money laundering scheme that used Holocaust victim loot to finance covert Cold War era operations against the Soviet Union and its allies. The lawsuit was filed in U.S. District Court in San Francisco. Like with the Jews, who had to wear the Star of David in public, the Serbs were forced to wear a blue band with the letter "P" (i.e., Orthodox) on their sleeve. As far as I know this never happened. There was idea to force Serbs to wear a green band with the letter "P" but it was never realized. Never the less, very interesting text. The only problem whit this kind of text is that it will never be approved as "historical" in Croatia. For Croat government this will always be "communist propaganda". Is this article by Sean Matgamna of Alliance for Workers' Liberty?